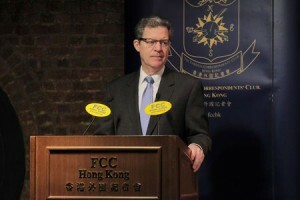 Sam Brownback on Friday said in a speech in Hong Kong that China was waging “war with faith” and that it needed to respect the “sacred right” of people to worship, especially Muslims locked up in internment camps in Xinjiang. Chinese President Xi Jinping sought to reassure people in Taiwan in January that religious and legal freedom on the island would be respected under a peaceful “reunification”. Taiwan President Tsai Ing-wen has in return rejected Xi’s call and instead urged China to embrace democracy. Brownback’s visit to Taipei was viewed by some in Taiwan as a sign of support from the Trump administration amid growing friction between Taipei and Beijing. The United States switched diplomatic recognition from Taiwan to China in 1979, acknowledging that China takes the position that there is “one China” and Taiwan is part of it. But the United States is also Taiwan’s biggest ally and arms supplier and is duty-bound by legislation to help the island defend itself. China was strongly opposed to the envoy’s “wrong comments” about religious freedom and had lodged “stern representations” with the United States, Lu said, adding that China protected religious freedom.